I jumped on the bandwagon and asked for an Instant Pot for Christmas. Santa was good to me and I got one, but I hadn’t tried it since I got it. 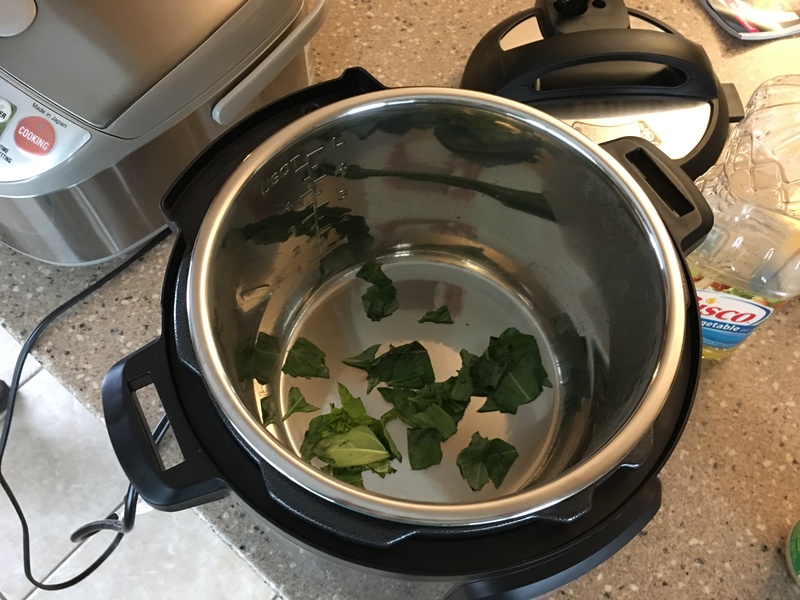 I haven’t been especially nervous about cooking with an Instant Pot, but my husband and I go out to eat a lot and I just haven’t had a chance to sit down and figure it out. 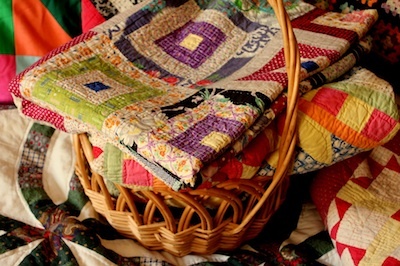 (It’s one of the perks of being an empty nester. I feel no obligation to cook.) Well, I am so glad I finally tried it on Saturday night! It is amazing. 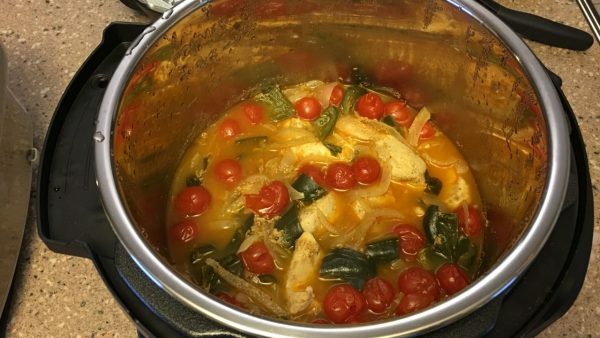 I tried one of the recipes from the book that came with the Instant Pot, and we were hooked. I had a few mishaps with this recipe because I thought I had a ton of curry powder, and I ended up having none. So I decided to try as best I could with the alternative five spices. Unfortunately, of the five spices, I had chili powder and cumin. The concoction would have tasted different with the correct spices, but it was still delicious. I served this recipe over rice. Enjoy! I only used a few fresh basil leaves, but you can use more if you prefer. 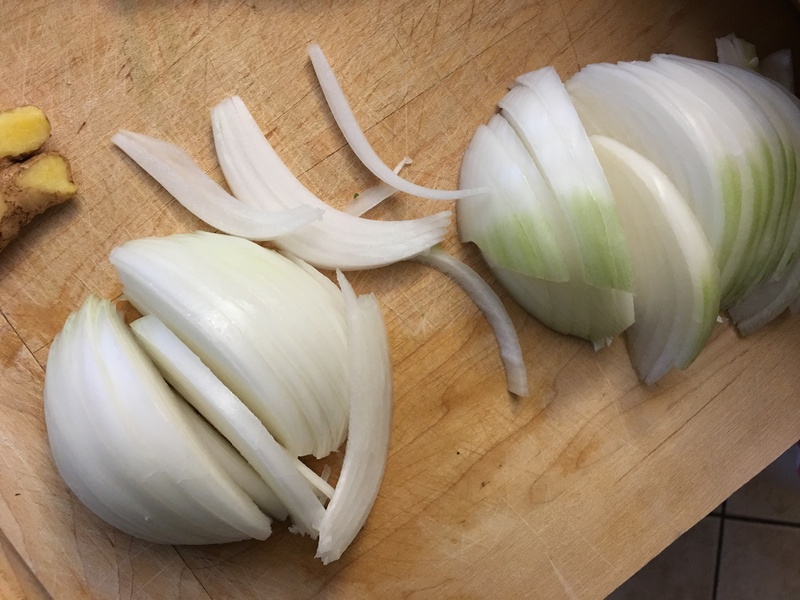 I usually dice my onions, but cutting them into strips gave us a good mouthful when we ate the curry. I would also highly recommend fresh grated ginger. There is nothing like the aroma of ginger when you’re cooking. I added a little extra oil because it felt dry after I sautéed it. But it smelled so good. The cherry tomatoes stay nice and bright, and the peppers are colorful too. It’s a beautiful bowlful. Press Saute to preheat the cooker. When the word “Hot” appears on the display, add a swirl of oil, drop in the curry leaves (I used basil), and lightly fry until golden around the edges, about 1 minute. Add the onion, garlic, and ginger and sauté until the onion is soft. Add the curry powder mix or the five spices and sauté them together with the onions until they have released their aroma, about 1 minute. Deglaze with the coconut milk making sure to unstick anything from the bottom and incorporate it into the sauce. Add the green chiles, tomatoes, and chicken pieces. Stir to coat the chicken well with the mixture. 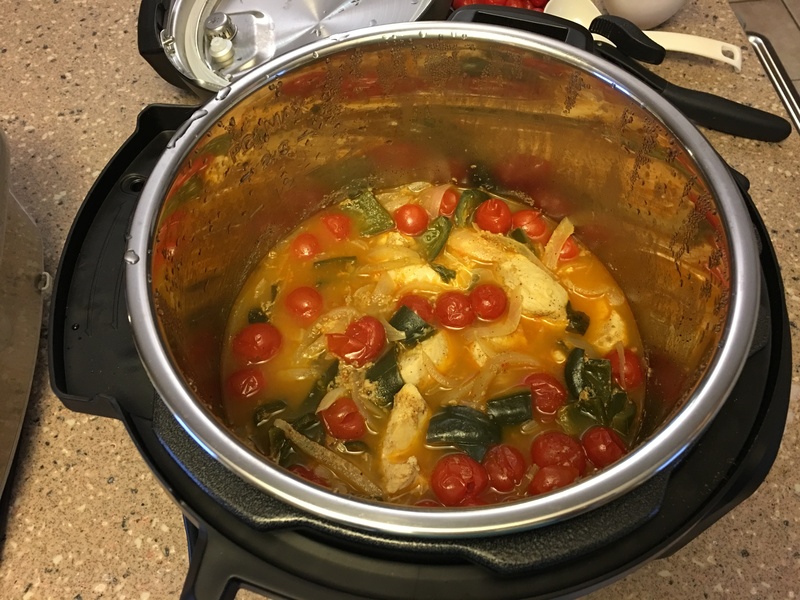 Close and lock the lid of the Instant Pot. 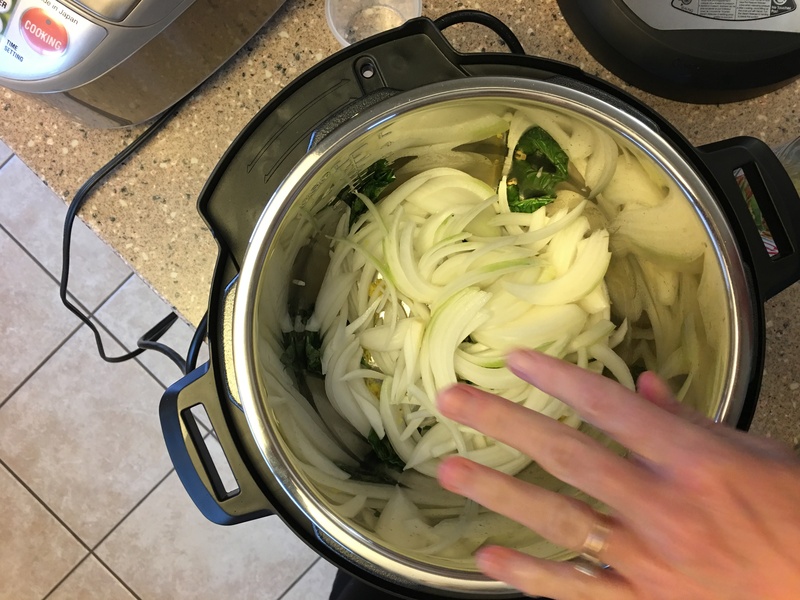 Press Pressure Cook and use the [+] or [-] button to set 7 minutes of pressure cooking time. When time is up, open the cooker using Quick Pressure Release. Add salt and lemon juice to taste just before serving.